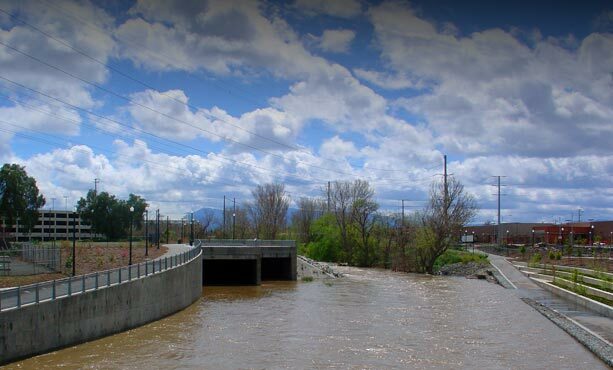 Click here to see a video about Flood Control on the GRPG! After decades of governmental studies, on-again/off-again funding, several design changes and lots of public discussion, the $242 million Downtown Guadalupe River Flood Protection project was completed in 2004 – under the direction of the U.S. Army Corps of Engineers and the Santa Clara Valley Water District. The Downtown Project, which also incorporates park elements and trails developed by the San Jose Redevelopment Agency and the City of San Jose, stretches from Highway 880 south to Highway 280. The Santa Clara Valley Water District has two additional projects along the Upper and Lower Guadalupe that also integrate flood protection, public access and environmental restoration along the Guadalupe River from Almaden Valley to Alviso. The Lower Guadalupe project in the Alviso area was also completed in December 2004, ensuring that floodwaters from the upper reaches of the river can be carried successfully through the lower Guadalupe River to San Francisco Bay. The Upper Guadalupe project is scheduled to be constructed over the next 15 years. Together these projects will safeguard hundreds of homes, schools and businesses from flooding and also enhance habitat for endangered fish. Although the projects are being funded and constructed separately, the Water District is working together with cities and regulatory agencies to develop the projects utilizing a watershed-based approach. In 2003, the California Coastal Conservancy granted $750,000 in State Proposition 40 funds to the San Jose Redevelopment Agency for the development of a comprehensive signage program for the Guadalupe River Park & Gardens. The Emeryville design team of Ellipsis, in partnership with the Office of Michael Manwaring and Royston, Hanamoto, Alley & Abey, was awarded a contract to develop the signage. The San Jose Redevelopment Agency staff solicited citizen input from Guadalupe River Park Conservancy and the Guadalupe River Park Task Force. The program consists of both directional and interpretive signage that is informative and educational, but also has a unique character in keeping with our vision of the park as a major regional attraction. Many of the signs were in place for the grand opening of the Guadalupe River Park in September 2005 and the remaining signs were placed by early 2006. Why did we need the project? The Guadalupe River frequently flooded San Jose’s downtown and Alviso community, with numerous severe flooding events in its history. Most recently, the river flooded in 1982, 1983, 1986 and 1995. In February 1986, the river overflowed its east bank upstream of St. John Street, flooding residences and businesses. In January 1995, a similar flood occurred and flooded the same area. In March 1995, severe flooding occurred when the Guadalupe River and Los Gatos Creek combined to produce the highest flow in 50 years. In the most extensive flooding of the city’s core in four decades, streets turned into rivers, forcing residents from their homes and driving office workers from high-rise buildings. Approximately 300 homes and businesses were flooded by four separate breakouts along the river, with damage estimates of up to $10 million. According to a 2001 U.S. Army Corps of Engineers report, average annual equivalent damages are $27.25 million. The Guadalupe River’s natural channel directly upstream of the confluence with Los Gatos Creek has a capacity of 7,000 cubic feet per second (cfs), roughly the flow of a 10-year flood event. By modifying the channel, replacing bridges, protecting against erosion and building a bypass box culvert to handle high flows, the capacity of the channel was improved to handle 14,600 cfs upstream of the confluence with Los Gatos Creek and 17,000 CFS downstream of the confluence. The additional capacity was designed to protect the area from a 100-year flood event. The Downtown Project is the second project in a string of three projects along the river, starting at San Francisco Bay and moving upstream (south) to where the river meets Blossom Hill Road in south San Jose. The projects are being built in stages, so that the downstream projects are complete before the upstream projects. The Lower Guadalupe Project improves the capacity of the river from the Bay to Highway 880, and was completed in December 2004. Now the channel is able to safely pass the 100-year flood flow from the Downtown Project. Similarly, with the Downtown Project complete, successfully handles the flows from the Upper Guadalupe Project, which will modify the channel from Highway 280 to Blossom Hill Road and is now in the engineering and design stages. With the proper permits and with funding from the federal government, the projected completion date for the Upper Guadalupe Project is December 2016. The project was authorized by the federal government in 1986. In 1991, the water district and city agreed to incorporate plans for Guadalupe River Park into the flood protection project. Work actually started on the project in 1992, and was halted in 1996, when the water district agreed to review the existing project plan in order to ensure that the planned flood protection measures didn’t adversely affect the native fish populations. After a successful collaborative process with many interested parties, parts of the project were redesigned to avoid impacts that affected anadromous fisheries habitat, and construction resumed in 1999. The process to plan, design and build any project of this size and complexity is, by definition, a long one. The Guadalupe River plays many critical roles, as a habitat for fish, animals and plants; as a community resource; and as the main waterway to drain more than 170 square miles of Santa Clara County. Consequently, many regulatory and resource management agencies, municipal offices and community groups are interested and have had a voice in planning the project. That valuable input-gathering process is time-consuming. When was construction started? When was it finished? Construction actually began on the Downtown Project in 1992, and the section from Coleman Avenue to Highway 880 was completed in 1996. Between 1996 and 1999, construction was halted as the Guadalupe River Flood Control Project while the Collaborative worked to resolve concerns with the authorized project. The Corps of Engineers and the Santa Clara Valley Water District agreed to redesign some elements of the project in order to protect and preserve and/or restore the natural environment of the river, as well as provide flood protection. Those issues resolved. Construction began in October 1999 from Interstate 280 to Woz Way, near the Children’s Discovery Museum. The remaining construction work on the project began in Spring 2002 and was completed in December 2004. What will happen to the fish? The Guadalupe River provides habitat to steelhead and salmon, both considered special status fish species. This project has been designed to protect and preserve the habitat the fish need to migrate and spawn. Fisheries mitigation will take place within the project, immediately downstream of the project, and upstream on Guadalupe Creek between Almaden Expressway and Masson Dam. Throughout the county, the water district is working to protect and, in some areas, enhance the natural habitat in order to support the needs of native fisheries by removing barriers, installing fish ladders, and installing and maintaining shaded riverine aquatic cover to reduce water temperature and provide cover. Will there be trails when the project is finished? The flood protection project is one element of the Guadalupe River Park Master Plan, which includes approximately three miles of hiking and biking trails along the river. The long-term vision is to link with the Los Gatos Creek Trail and other trails north to Alviso and south to the Almaden Valley. Will I no longer have to pay for flood insurance? Part of the reason for providing flood protection is to relieve citizens and businesses of the necessity for flood insurance. Once construction is complete, the Water District submitted an application to the Federal Emergency Management Agency (FEMA), asking them to revise the flood maps for the newly protected areas. The intent is for the properties currently in the adjacent flood plain to be removed from the flood plain. Can I eat the fish in the Guadalupe River? Because of the presence of naturally occurring mercury in the Guadalupe Watershed, the state Department of Fish and Game has advised that no one should consume any fish taken from the Guadalupe River or Guadalupe Reservoir. For more information or for fishing regulations in the watershed, visit www.dfg.ca.gov or call (916) 653-7664. The Guadalupe River frequently floods San Jose’s downtown and Alviso community, with severe flooding in 1862, 1895, 1911, 1955, 1958, 1963, 1969, 1982, 1986 and 1995. The Guadalupe River’s natural channel directly upstream of the confluence with Los Gatos Creek has a capacity of 7,000 cubic feet per second (cfs), roughly the flow of a 10-percent or 10-year flood event. In February 1986, the river overflowed its east bank upstream of St. John Street, flooding residences and businesses. In January 1995, a similar flood occurred and flooded the same area. In March 1995, severe flooding occurred when the Guadalupe River and Los Gatos Creek combined to produce the highest flow in 50 years. In the most extensive flooding of the city’s core in four decades, streets turned into rivers, forcing residents from their homes and driving office workers from high-rise buildings. Approximately 300 homes and businesses were flooded by four separate breakouts along the river, with damage estimates of up to $10 million. According to current U.S. Army Corps of Engineers estimates, average annual equivalent damages are $27.25 million. 1945 June 6-the Army Chief of Engineers endorses the Preliminary Examination Report of the Guadalupe River. The endorsement authorized a flood control investigation of the river. 1986 Section 401(b) of the Water Resources Development Act (Public Law 99-662) authorizes construction of the Downtown Guadalupe River flood protection project. 1990 The Energy and Water Development Appropriations Act includes funds to begin construction. 1991 Santa Clara Valley Water District and City of San Jose agree to incorporate a Guadalupe River Park with the flood protection project. 1992 The California State Water Resources Control Board issues a Conditional Section 401 Water Quality Certification to the Corps. 1992 The Corps and the District execute the Local Cooperation Agreement for construction of the project and development of the recreational elements. 1996 Construction is halted as the Guadalupe Project Collaborative is established. In July 1998, the Corps and District agreed to redesign a portion of the project and to revise the mitigation plan. Accordingly, the members of the Collaborative executed a Dispute Resolution Memorandum. The Corps and the District, in coordination with environmental regulatory agencies and the Collaborative, then refined the project modifications to satisfy the Endangered Species and Clean Water acts, and developed an acceptable mitigation and monitoring plan. The redesigned project and associated plans were offered for public input at scoping meetings in 1999, and the General Re-evaluation and Environmental Report, including the Environmental Impact Report and Supplemental Environmental Impact Statement, was approved by the Corps headquarters in 2001. On Nov. 16, 2001, the Army’s Director of Civil Works signed the Record of Decision approving the modified project. ~Improve current capacity of natural channel. ~Along with Lower Guadalupe and Upper Guadalupe Flood Protection Projects, will remove a number of buildings from flood-prone area.